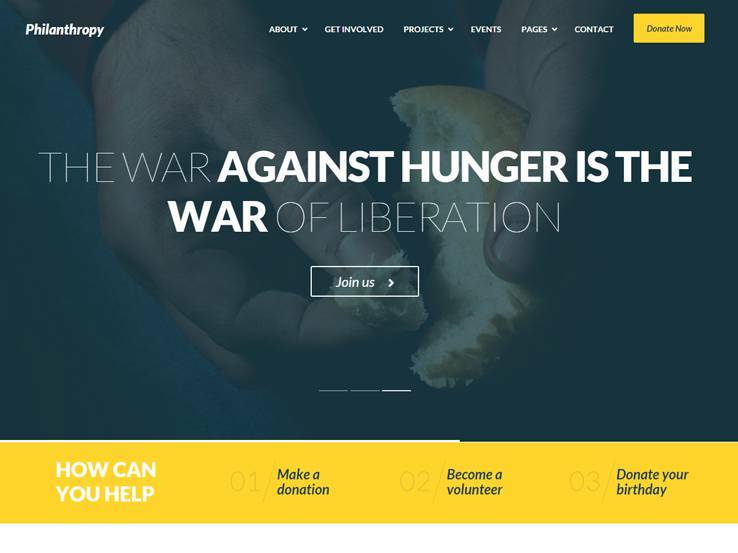 Like many website templates these days, themes for your charitable organization are incredibly affordable without sacrificing functionality or aesthetic. Some of them ship with multiple frontpage options, which equates to more design possibilities for you. You will also most likely need a way to collect donations, whether for a church, NGO, political cause, foundation, charity run, or something else. This can be achieved by integrating a simple PayPal button, but we like having a built-in donation system or integration with WooCommerce. 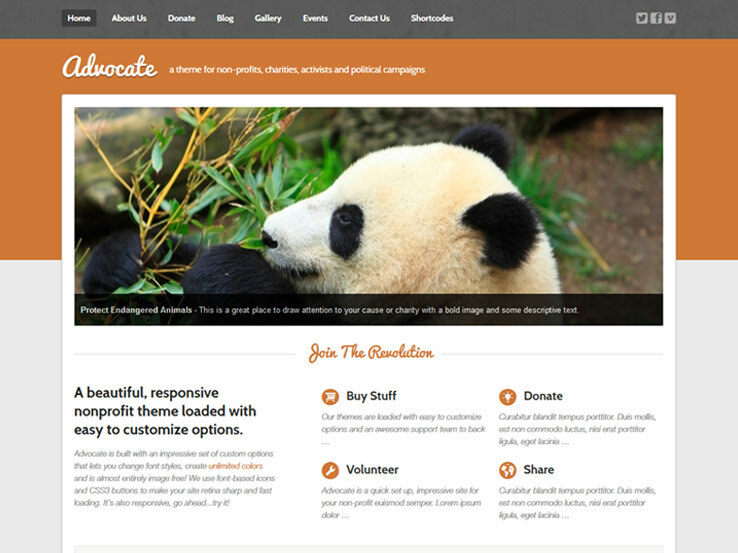 The best non-profit themes include full blogs with responsiveness for viewing on mobile devices. And, of course, it’s essential to have areas for posting events and sharing information about your team, recent campaigns, news and the like. 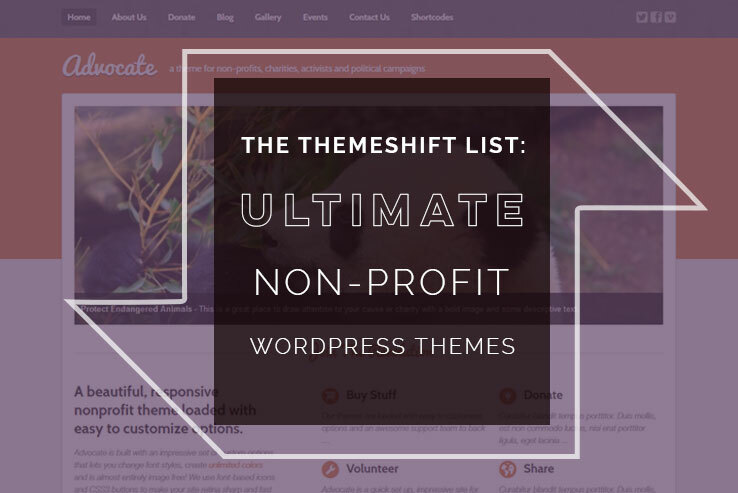 The world of non-profit themes is surprisingly active, so you shouldn’t have any problem locating the best solution for your charity, church, or another non-profit organization (NPO). 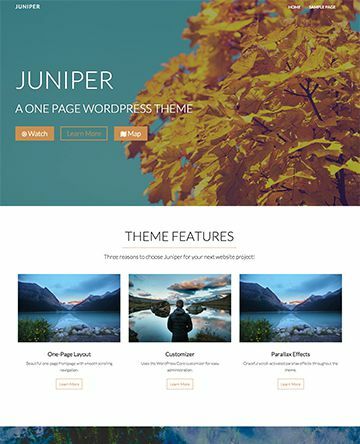 If you happen to stumble upon another interesting non-profit WordPress theme, let us know all about it in the comments section after the article. Hope is an ideal solution for non-profit organizations. The theme is equipped with all the features essential for this type of websites. Powerful ThemeRex Donation Plugin will help you to manage your fundraising campaigns. The template provides you with drag-and-drop functionality thanks to the Visual Composer plugin. One-click demo installation makes it easy to build a beautiful website with minimum efforts. Advocate, from Two 2 Twelve Themes, is a lovely basic theme that pairs friendly typography with soothing accent tones for an overall pleasing design that will engage your supporters from the get-go. But don’t let it’s apparent simplicity fool you – Advocate integrates widget areas and social media tools that combine to create an enhanced engagement platform for your organization. A custom calendar feature includes Google Maps integration, and a pre-made donation page lets you start accepting monies as soon as your NPO comes online. Call-to-action buttons alert viewers to your mission or upcoming campaigns, and a widget section under the frontpage carousel puts your most important content front-and-center. 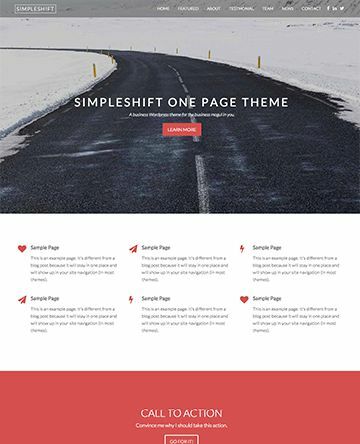 Two 2 Twelve themes is an Elite Author on ThemeForest and offers six months of free support for your theme, so you can rest assured that your questions about user donations or integrating a fundraising calendar will be answered in a timely manner. If you are looking for an arresting, dramatic frontpage that engages your viewers from the start, check out Philanthropy. Psychologically-speaking, its default yellow-and-black color scheme puts the viewer on alert, conveying that your organization’s mission is a pressing matter that should be taken seriously. Scroll down the clean, modern frontpage to see parallax effects and a smart “How to Get Involved” section that invites interested parties to donate, volunteer, or support an event. This NPO theme encourages user engagement on every page by integrating widgets such as current projects, newsletter signup, and donation opportunities. The donation function is worth delving into a bit – check out the Donate page for a view of the public-facing “cart.” This is powered by the Give plugin, which integrates seamlessly with Philanthropy. 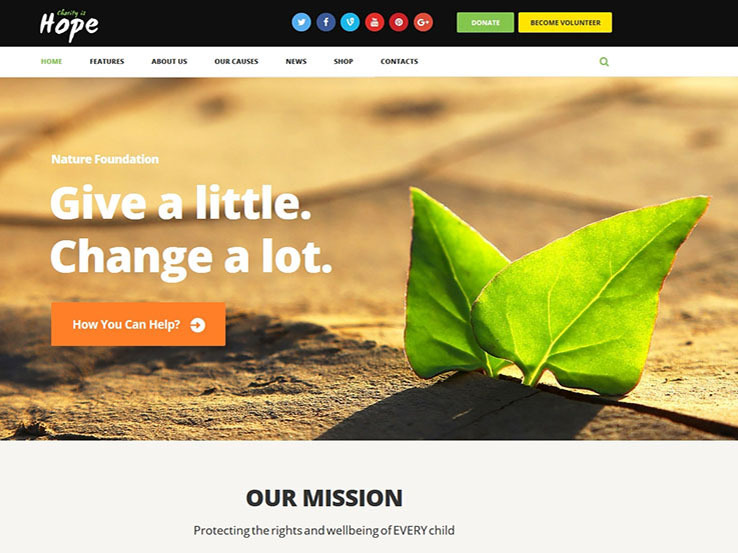 This responsive, Retina-ready template is a beauty, well worth consideration for your charity website. Peak is touted as a drag-and-drop charity theme that plays well with popular, trusted plugins like the aforementioned Give donation plugin, WooCommerce, SiteOrigin page builder plugin, and Tribe events calendar plugin. 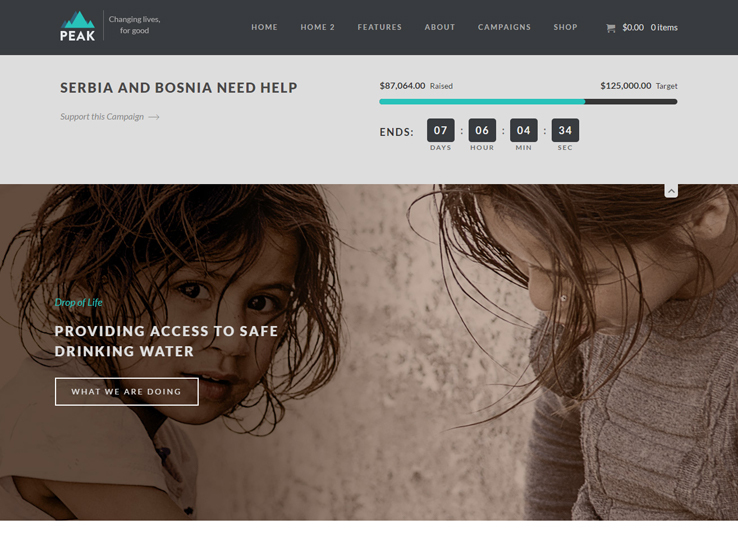 Add a featured campaign across your site and you will see a countdown timer and fundraising meter show up on the site header. 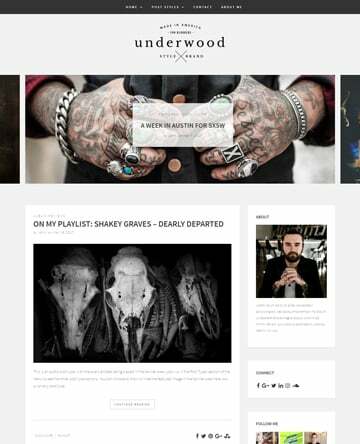 Smooth scrolling down the page leads the viewer past the full-screen banner to an action, or events, timeline, portfolio pages, blog posts and more. If the default homepage layout doesn’t fit your charity’s needs, opt for the second homepage design instead – this one includes a video slider option, “About the Team” and “Facts” sections, and more. 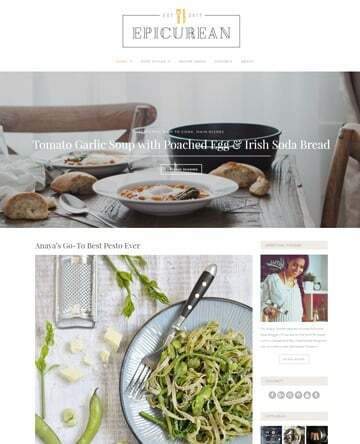 Responsive, full-width and boxed-width options are available, along with an AJAX gallery, Google Fonts and Retina-ready icons. This is a complex and comprehensive website template for your NPO that shouldn’t be overlooked! Whether your website will be for a political cause, charity or church, Kause has you covered. Integration is crucial for these themes, and Kause supports bbPress, the Events Calendar, BuddyPress, and WooCommerce, among others. Regarding design, Kause is simple, with a full-screen layout and simple horizontal navigation menu. Depending on its purpose (charity, church, or political), the theme’s look-and-feel will change according to which focus are you choose, which gives you a robust design to build on. Kause’s user reviews give a thumbs up to the theme’s authors for response time and ease of installation. True, Kause deploys with demo content in just seconds with the click of a button. Multiple homepage layouts, timeline, shop, calendar, donation integration, page layouts, and a variety of galleries all combine to give you a powerful tool for building your campaign or donation-oriented website. 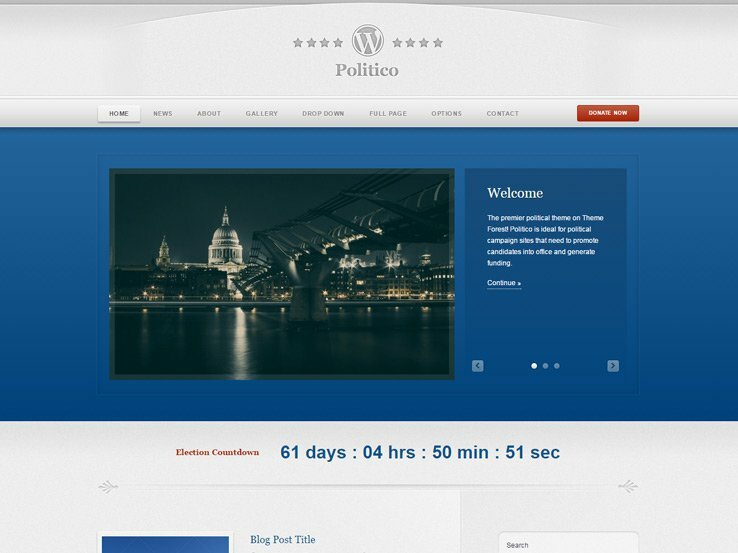 Consider this ThemeForest classic next time you need a website for a political non-profit or campaign. Politico possesses a timeless elegance, with its patriotic color scheme and understated decorative ornaments throughout the site. Social media integration, a full blog feature, countdown timer, and bright red “Donate” button in the header all help increase user interactions and encourage deep page linking. While geared toward political candidates, we could see Politico coming in handy for an international NPO or Washington think-tank. Its design is stately and modern without detracting from the actual content, a sophisticated website choice for a non-profit organization. 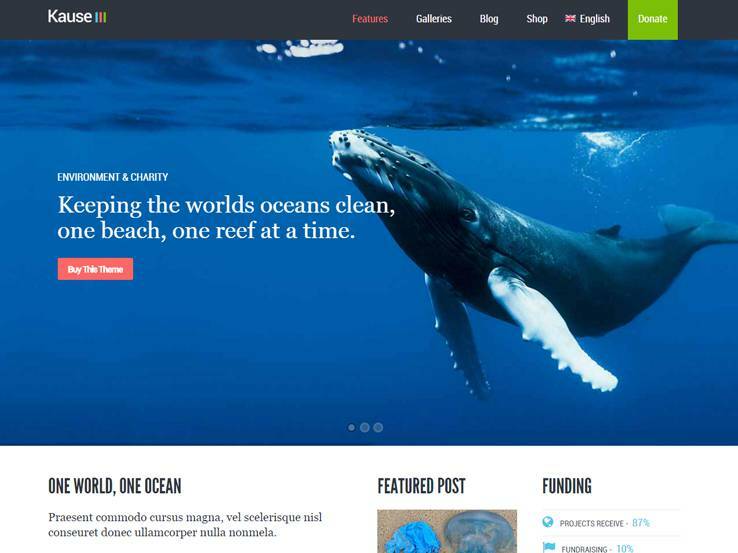 If you are looking for a site template that features a color scheme geared toward environmental groups, Green Earth may be for you. When visiting the site, users are greeted with an engaging and feature-rich banner area that pushes them to take action by digging deeper into the site. Galleries, informational widgets, and an area to display your sponsors are also included. All of these aspects are not only de rigueur for the modern web world, they also give you an extra boost in building a web following and expanding your network of contacts. Localization is supported, so your website can reach international audiences. Moreover, Google Fonts, a page builder plugin, shortcodes, and portfolio are all included. This, along with built-in responsiveness, helps your non-profit website stay modern and accessible for audiences across the board. 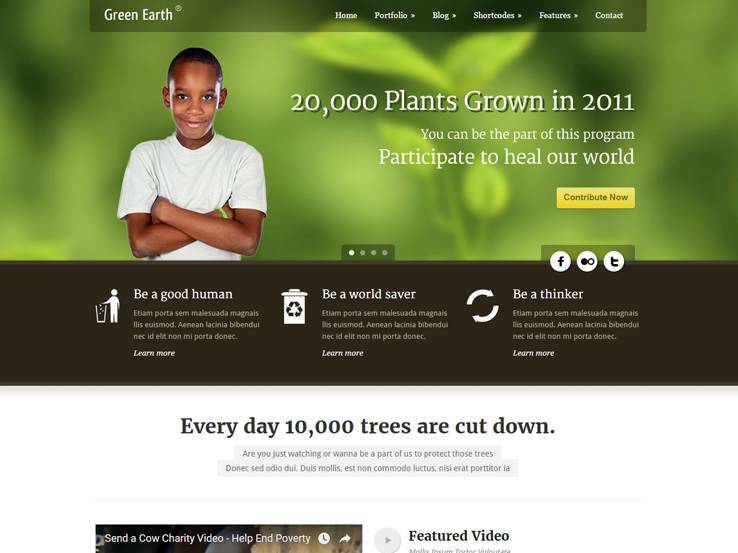 In need of a full-featured, flat design for your clean energy, NGO, or charity? Charitas Foundation theme from WP Look Studio comprises all of this, and then some. A rotating image carousel notifies your supporters of your most recent initiatives. The “Donate” button in the header prompts immediate action, and the “Progress” bar lets your users track how much money is being raised for a particular event or program. This website is not simply for advertising your services or stating your non-profit’s mission: it lets you share PDFs and files via a comprehensive document library. WooCommerce integration is possible with Charitas as well, and a portfolio image gallery lets you upload pictures from a recent mission trip or gala fundraising event. PayPal integration allows for immediate donations, and with a full support library of documentation you can rest assured that your website will be up and running in no time. Advertising at least 16 different homepage layouts, HelpMe theme from Designs Villa is a complete resource for any non-profit group, church or environmental organization. Core features include Layer Slider and Visual Composer support, so you can move content blocks around your page without having to do the heavy lifting on the back-end. A built-in mega menu allows you to feature all sorts of content in the navigation bar. Accept donations from your supports with the help of trusted industry players like PayPal, Authorize.net, and Stripe. Or integrate a countdown timer and progress bar to convey the immediacy of a project deadline and generate more donations. There is no limit on what you can or can’t accomplish with the HelpMe theme, so go play around with it and see what you think. 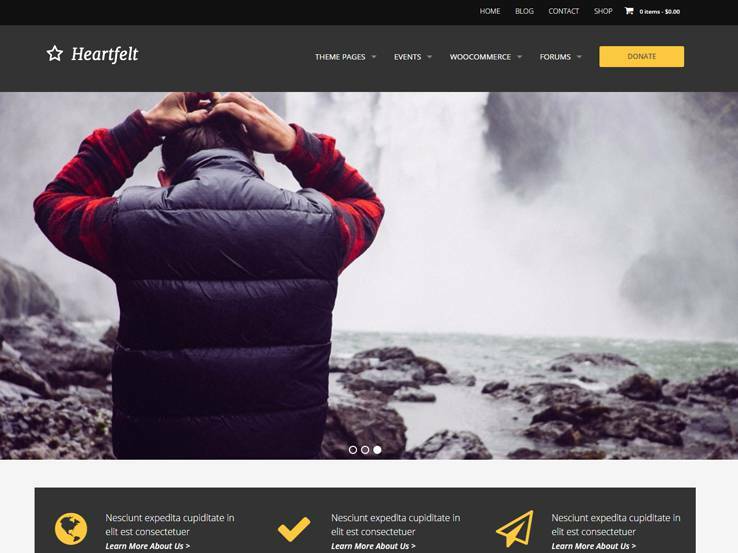 If you are in the market for a theme that showcases gorgeous images of your NGO or volunteer efforts, look no further than Heartfelt. Built on the Foundation framework by Zurb, this template ships with all the customary features you would expect from a non-profit theme, such as a Google Maps-integrated events calendar, unlimited color and font choices, WooCommerce integration, and even bbPress integration so that you can create and maintain community forums. 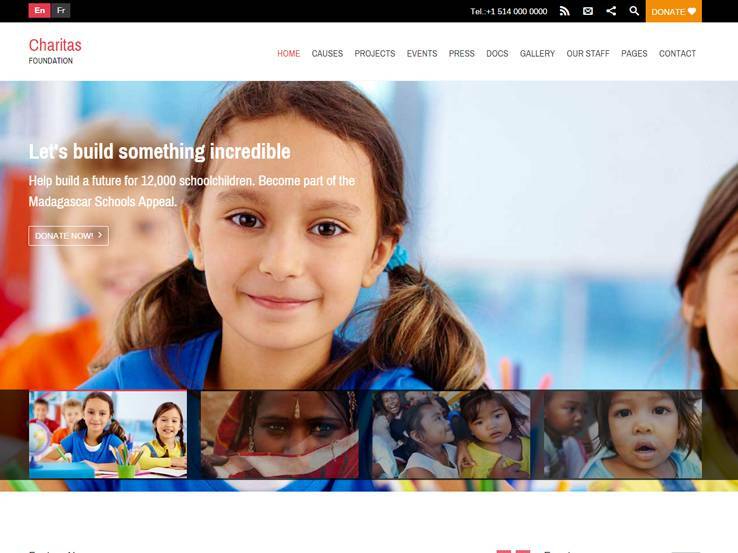 Why would a non-profit organization need WooCommerce integration? Well, consider it an alternative method to generating funds – sell t-shirts, bumper stickers and hats with your logo or a motivational quote on them. It’s free publicity, too! For additional user engagement, look to the enhanced social media features and a theme that displays neatly on tablets, Android devices and iPhones. And with donation features as well, there’s no telling what you can achieve with Heartfelt.